← Mr Mac hits the rocks! Where we live in the central belt of Scotland is blessed with really late light nights in midsummer. This means we can spend hours in the garden every evening, especially this year when we have had the added bonus (until two days ago) of a heatwave which was preceded by a long dry spell. For a week or so we were able to work in the garden until 11pm. The irony is that all the time spent outside gardening means I have been neglecting this blog (although those following my other blog www.ayearinmygarden2013.com will have been able to see weekly pictures of the garden). 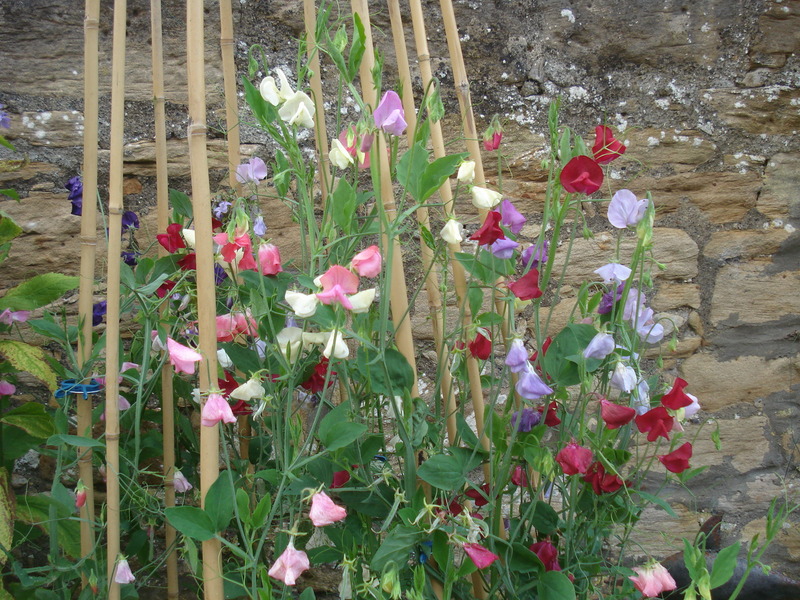 Some sweet peas that did not get eaten…..yet! 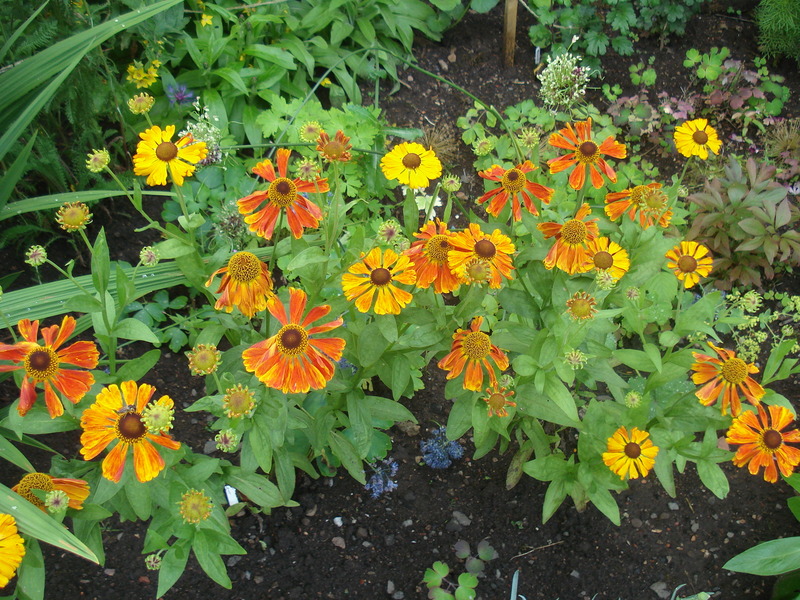 For the year up to the end of June I was working on a full time contract and so knew from early on that there was no way I would have the time to grow as many flowers from seed as I usually do. It has also become clear over the last few years that the solution to the empty spaces in our large borders is to fill them with perennial plants, cutting down on the need for annuals and bedding plants. 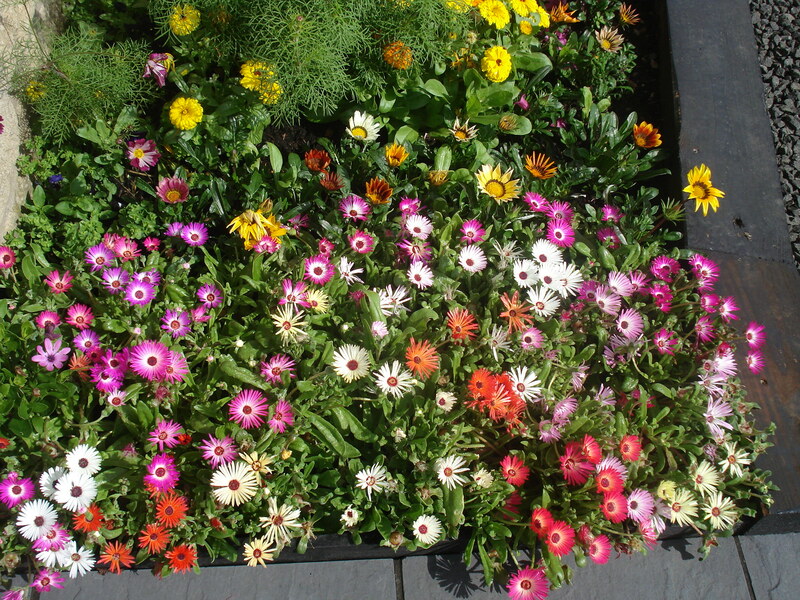 However, I still grew all my favourites from seed…cosmos, osteospermum, snap dragons, livingstone daisies, rudbeckia, gazania, zinnia, morning glory, sunflowers, sweet peas, marigolds and ladybird poppies. Also, new for this year (mainly due to the selection of free seeds with Amateur Gardening magazine) I tried hollyhock, nicotiana, laurentia, cleome, portulaca, aquilegia (lime sorbet), pansies, bellis, sweet william, foxgloves and swan river daisies (brachycome). 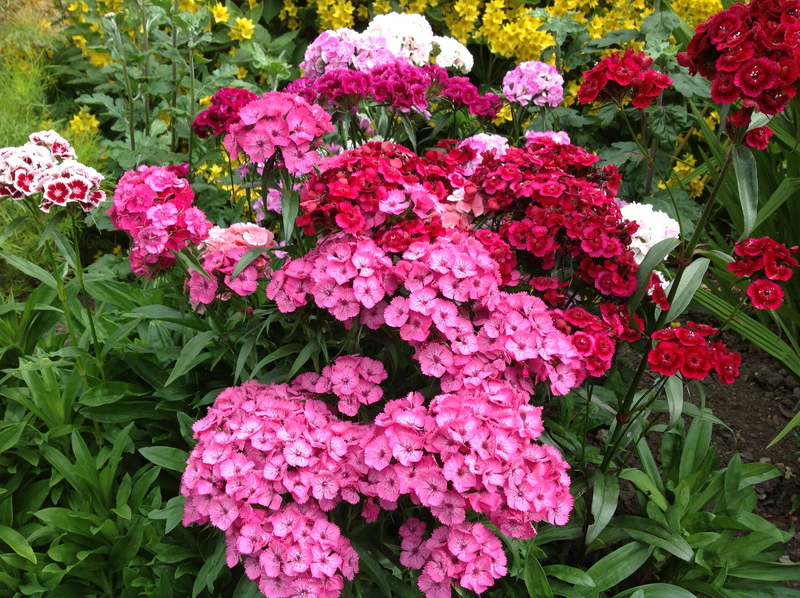 Sweet William – all from free seeds! I planted loads of gladioli and allium bulbs in the garden and for the first time am trying out agapanthus, calla lillies and freesias in pots. 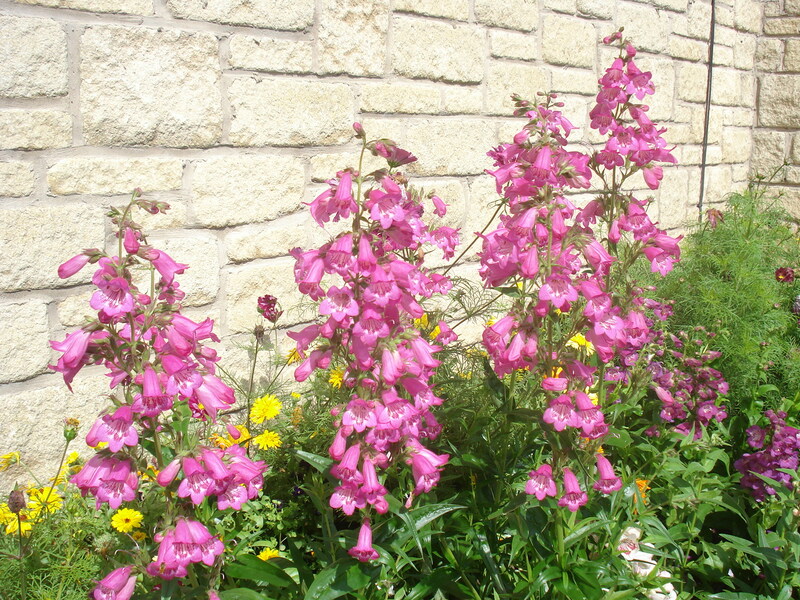 As for perennials, I kept a beady eye out for email and magazine offers and now have a collection of alstomeria, chrysanthemums, penstemons, heuchera and heucherella, coreopsis, monarda, dianthus, helenium, achillea and geums to name a few. The livingstone daisies, osteospermum and gazanias at the front door have created a stunning display, made even better by all the sunshine. Last year, it was so wet and cloudy all summer, that it was October before the gazanias even developed a flower bud and then the frost killed it before it even opened. From a free “double” packet of bellis and sweet william seeds received last year, successful germination meant I had to give loads of plants away. Mr Mac chucked the rest in the garden at the end of the autumn and we had given them up for dead when all of a sudden they just took off, producing hundreds of flowers and filling some huge gaps in the side border. They are biennials and so hopefully there will be many more to come next year as they have been left to self-seed. I was attracted to penstemons as they claimed to flower all summer long and slugs don’t like them….a huge issue for us last year. I went for a “blue” collection and an “ice cream” collection. They are certainly living up to their claim and I would definitely invest in some more. For a while I had my eye on some heucheras as I love the variations in colour and ground cover they provide. I ordered a heuchera collection along with a heucherella collection including varieties such as solar eclipse, alabama sunrise and sweet tea. They are starting to settle in and fill in some of the gaps……and I just love them. 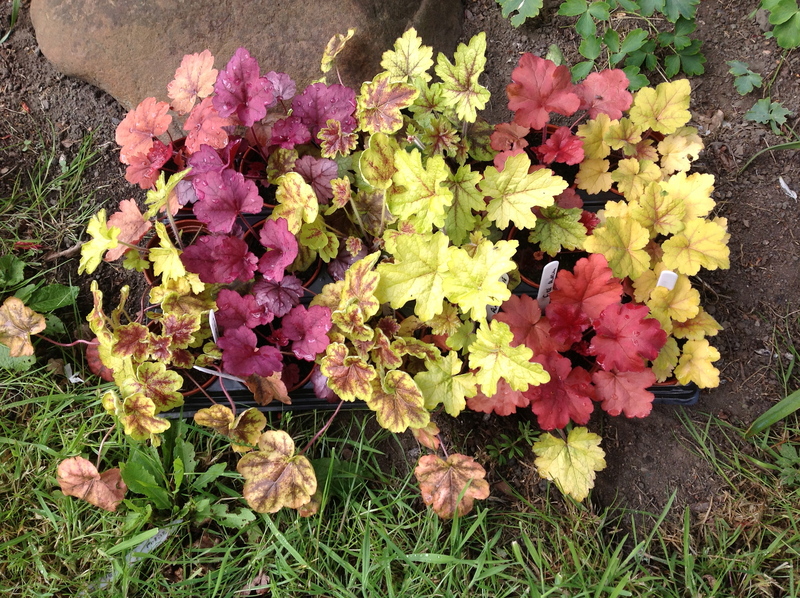 Some of the heucheras just ready to be planted out. This year for some reason, my Nana’s magnolia tree did not flower. 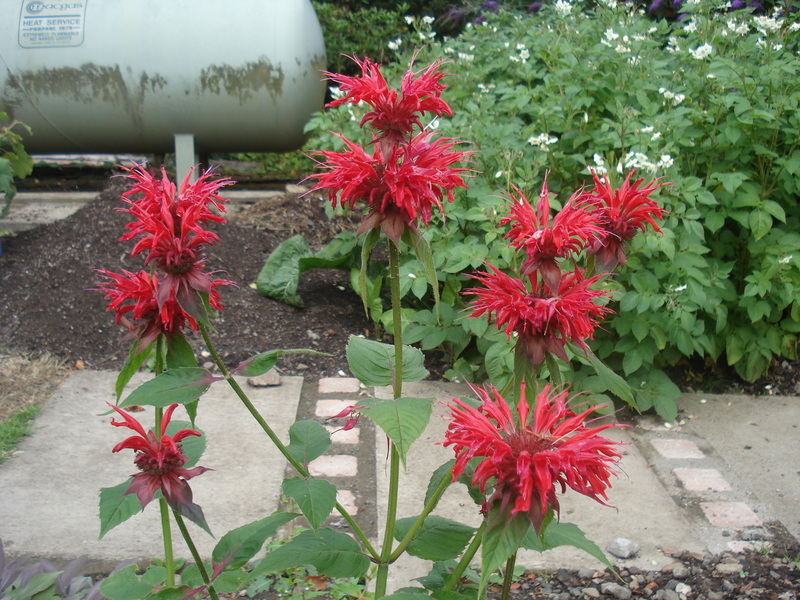 This is its third year in the garden and we had flowers for the first two years. Maybe it was the very cold Spring? A mystery, especially as all other magnolias in this area seemed to flourish. 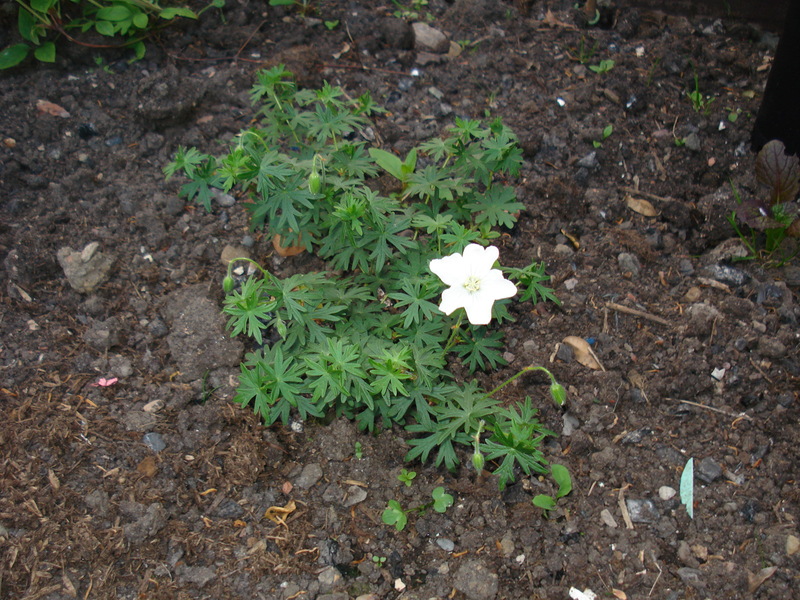 Two plants on my hit list for this year were meconopsis (Himalyan poppy) and Japanese anemone. I ordered one Anemone Serenade and two Meconopsis China Blue, all as established plants. I potted them on and then planted them out but with very limited success. The anemone just disappeared and the meconopsis took a long time to settle in and start growing but one of them has just turned to mush. I dug up the anemone roots and stuck them in a pot to see if it will grow back. I have supplemented the meconopsis with another two plants and hopefully next year will have some coveted blue flowers. Yet again I have had no success growing Black Eyed Susan from seed so, after four years of trying, I am calling it a day. The agapanthus bulbs were a slight afterthought and were planted right at the very end of the planting window. Three pots were planted up along with some freesia bulbs and only one pot has produced a shoot and even that has stopped growing at three inches! 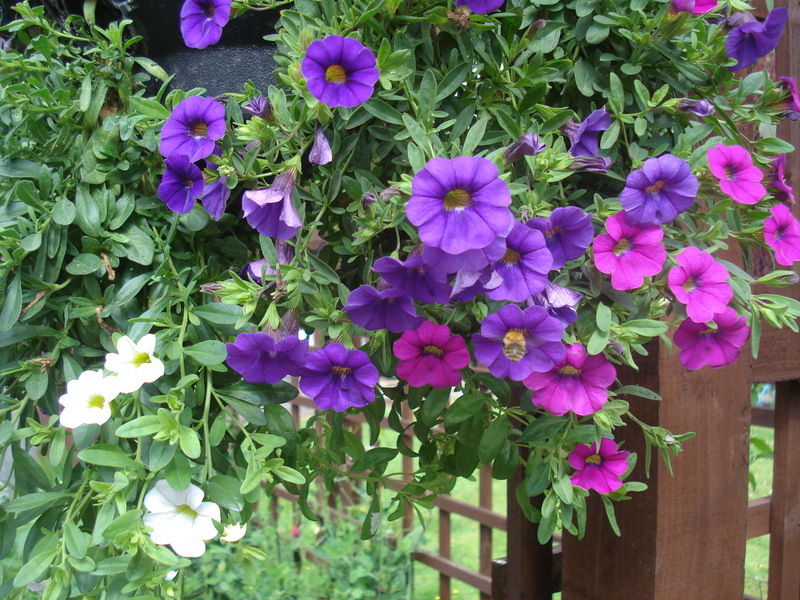 My hanging baskets saw mixed success. I planted them with million bells and trailing lobelia. The yellow millions bells have been lost to white fly. The lobelia was failing to trail but thanks to torrential rain storms over the last couple of days it has now been flattened into submission. 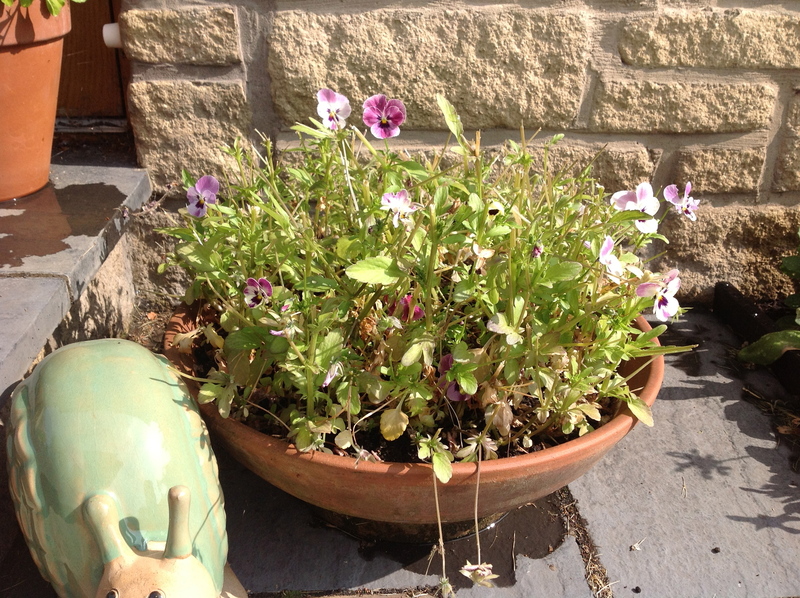 After having been under attack in the Spring from a combination of escapee sheep, a badger and potentially a pheasant we thought we were safe until one morning I discovered all my sweet peas, peas and pansies had been chewed down to the ground. This has since been followed by the geraniums, lupins, a whole hosta and my alstromeria. The prime suspect is one of the deer who I caught red handed earlier this week eating my parsnips. It is soul destroying but now, if it is not covered with netting, there is something whirly, dangly or sparkly nearby…..the garden is turning into an outside disco! 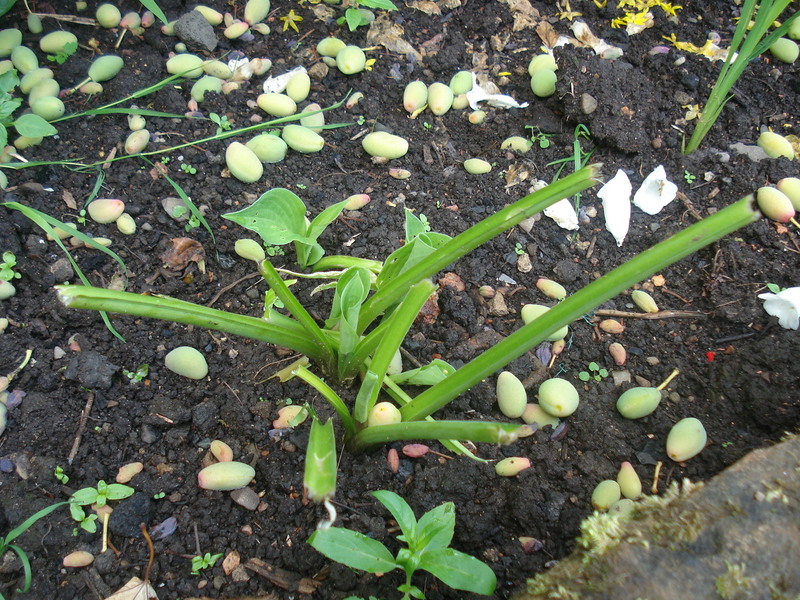 This was a hosta! It appears to be growing back though….no thanks to Bambi! A further mystery was when everything in one corner of the trellis border starting going brown and dying. Anemone de Caen bulbs planted last year starting to emerge and then just went brown and disappeared. The same happened to a selection of geranium plants I ordered last year and had overwintered in the greenhouse before planting out. We could not work out what was going on but there was a gap that needed filled and we bought some bedding plants to stick in. While digging the soil a strong smell emerged. It was familiar but we could not quite put a finger on it…..then lightbulb……it was white spirit. It turns out when we were having some painting done, the decorator cleaned his brushes at the outside tap then emptied everything into the soil beside it. 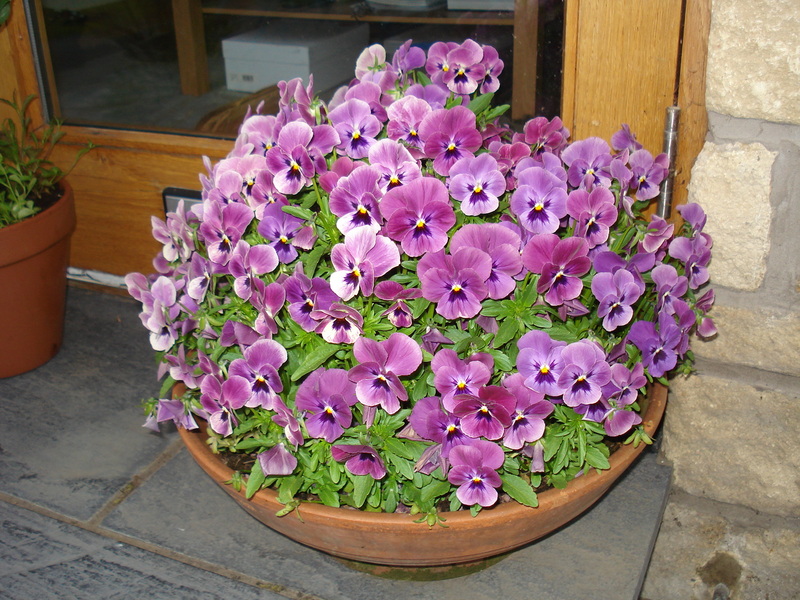 Archie – you owe me three geraniums and a packet of Anemone bulbs! 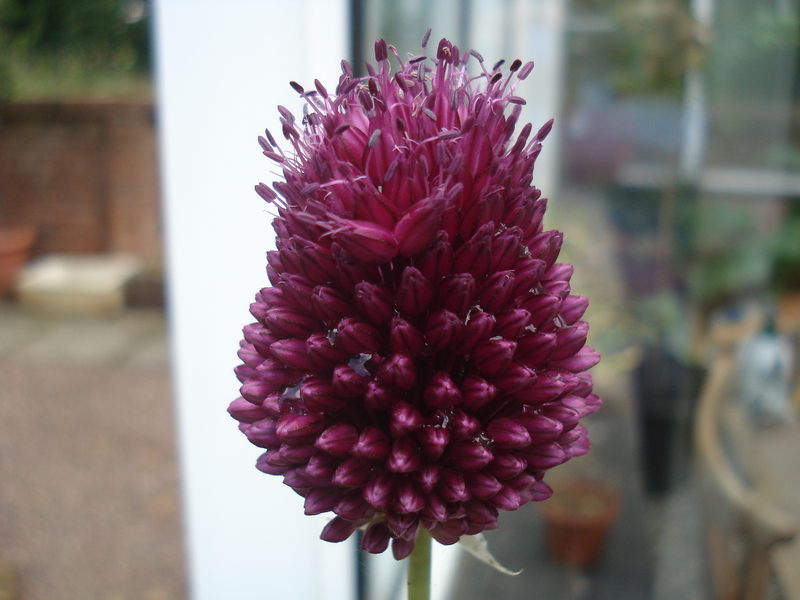 This entry was posted in Flowers and tagged allium bulbs, Calla Lillies, flowers, plants. Bookmark the permalink. 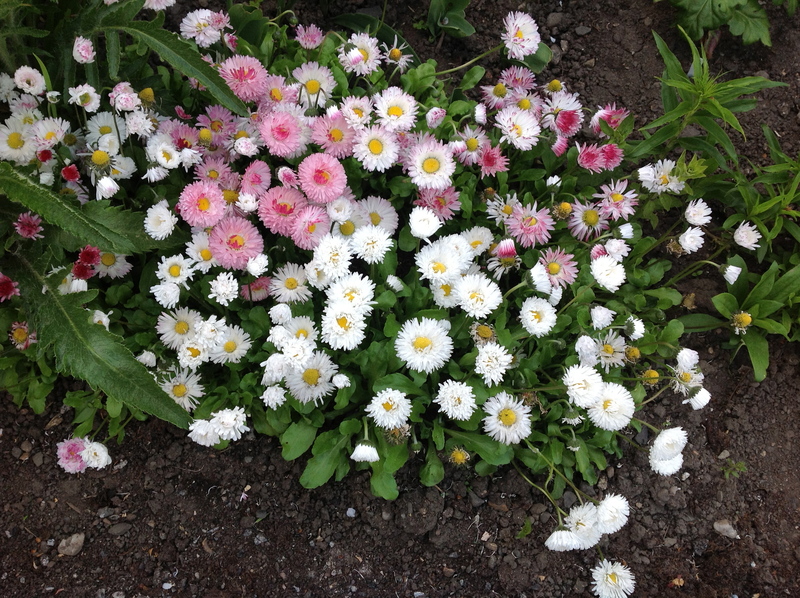 Hi Fiona ……I love your flowers can’t believe that they all came from seeds………mine were a disaster this year. I started them of to early and by the time they were ready to plant out the weather down here was so cold up until May that they all died…I will try again next year…..not having a green house doesn’t help…..I love nicotania and always try to grow from last years seed. You have obviously inherited the Cullen green fingers. I am always in my little garden just love it….my Hibiscus is just about to bloom and love that every year. 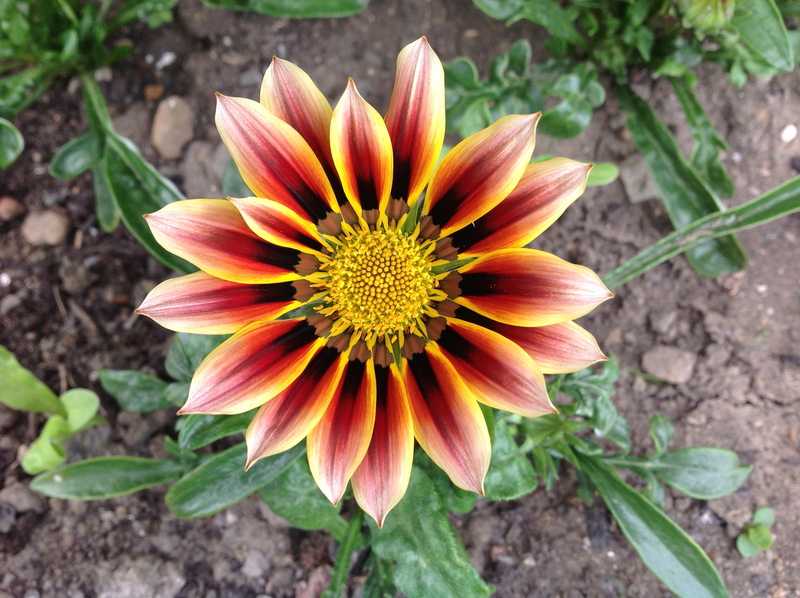 Went to Hampton Court Flower Show this year and as always it was fantastic…..came away with loads of ideas. Great to hear from you and look forward to hearing from you.